NGC 2264, The Cone Nebula, The Christmas Tree Cluster, and the Fox Fur Nebula. It can be found in the constellation of Monoceros, and is part of a much larger H-alpha rich region, which also includes the Rosette nebula. 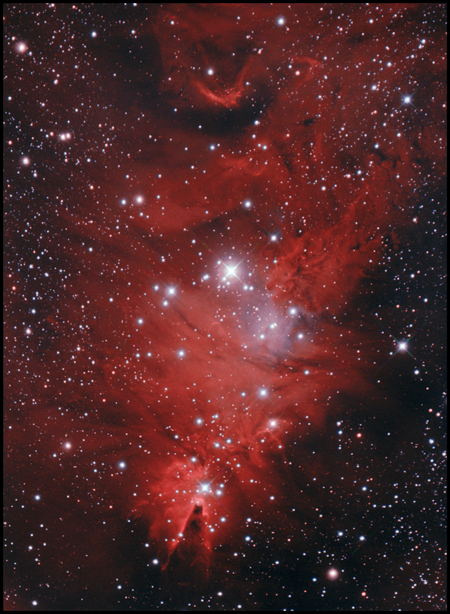 The Christmas tree cluster can easily be seen in a small telescope, and when seen without the surrounding cloud, does look very much like a Christmas tree. If you look at this image upside down you'll see it. The Cone nebula is at the bottom, and is about 7 light years long. The Fox Fur nebula is in the centre right of the image, and is well named I think. I tried to image this for the first time in late 2007, when I'd first got my Atik 16HR, and was surprised how faint the nebula was. At the time, I binned my subs 2x2 to increase sensitivity, but was never happy with the resultant lack of resolution. In 2008 I wanted to have a go with unbinned subs, so, if I wanted a decent signal to noise ratio, I knew I'd need more subs. This was imaged on the 7th, 9th,10th,11th & 12th December 2008. It was awarded joint picture of the week on StargazersLounge for Christmas week, 2008. Telescope. William Optics ZS80FD .with 0.63x focal reducer. All subs are 8 minutes unbinned. Green was synthesised with Noels' actions. Ha was also used as a luminance layer.